Wedding trends come and go but one trend that seems to be making a big splash – at least for some couples – is ‘trash the dress’! For those who haven’t heard of it, ‘trash the dress’ is a fun add-on to your wedding day that sees the bride – and sometimes the groom – trash their wedding outfits just for kicks and some stunning and unusual photos. While there are no doubt some brides reading this who are practically fainting at the thought of trashing their wedding dress – you do, after all, spend many hours choosing it and probably a lot of money buying it – there is more than one way to trash your dress and not all of them have to be a complete write-off. For those who really want to go to town, the options are limitless. You can trash the dress in any number of ways including paint fights, red wine attacks, cake throwing and even ripping the clothes from one another’s backs. The ‘no holds barred’ approach is heaps of fun and guaranteed to make for lots of laughter and memorable moments with your new husband, as well as some very memorable photos. For those who like the idea but prefer to hang on to their dress, there are options such as swimming in the ocean together (or underwater if you can hold your breath long enough) and fun activities such as pillow fights or rolling around together in a flower-strewn meadow. If you’re not going to sell your dress, why not have some fun with it? Otherwise it’s just going to sit in a box for years with moth balls like many other brides. For the best results, create a theme – come up with something dramatic – create a piece of art. It takes planning and props but that’s where your wedding photographer can help. After deciding on a look, couples can leave the rest to them and just have fun. The men also seem to really like it and it results in some very unique photos to remember your wedding day by. And for brides who can’t decide between trashing the dress and saving it for posterity – do both and buy a second dress for the ‘trash the dress’ session. Who says you can’t have it all! 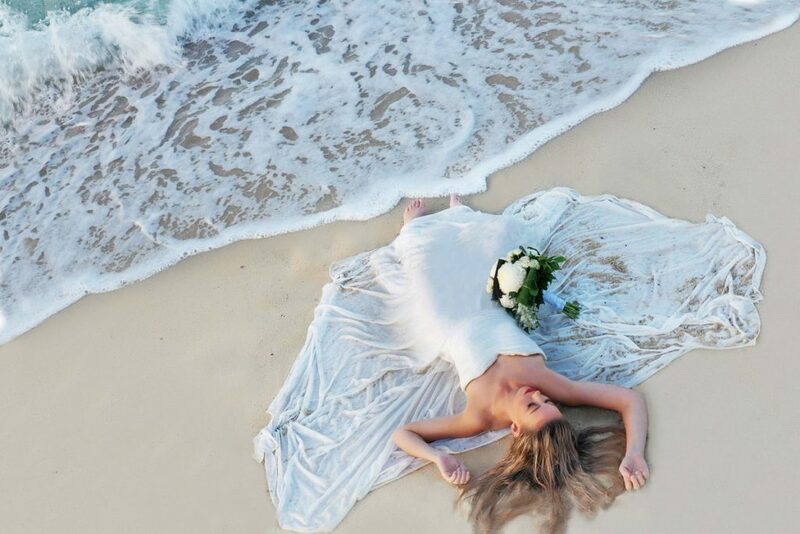 Hire a helicopter or seaplane and head to Whitehaven Beach to trash the dress on one of the worlds most famous beach, and get a bonus sightseeing tour at the same time! 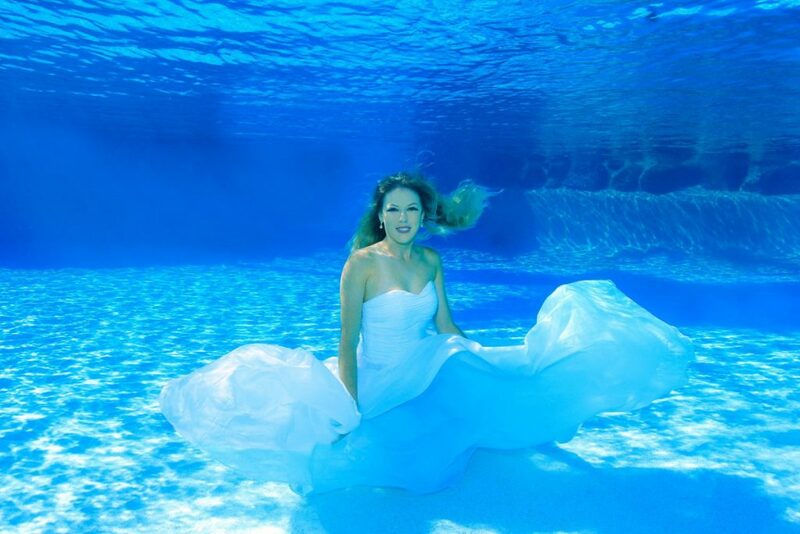 Make the most of your wedding accommodation and use their pool for some crystal clear underwater shots. Head to Conway Beach at low tide and make the most dramatic scenes imaginable. The Coral Sea Resort Jetty is the perfect seaside backdrop with shallow pools of water and rocky outcrops making for some great scenes. The Airlie Beach Lagoon is an iconic landmark of the Whitsundays and with holidaymakers in the background in bikinis and board shorts you will get some very funny shots. Trash it with colour! Hamilton Island Weddings provide colour bomb trash the dress photo shoots the day after your wedding.